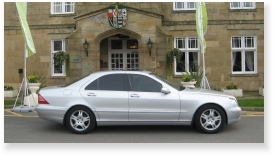 We offer an immaculate fleet of S class, E class & Mercedes MPV's. The S class & E class Mercedes are both saloons with the S class being the larger of the two. Both of these vehicles can carry up to 4 passengers and luggage. The Mercedes MPV's are executive people carriers and can carry up to 6 passengers and luggage. The vehicles are all metallic silver and present an impressive corporate image when travelling and arriving together. The E class Mercedes is a stunning saloon and provides a comfortable and reliable transfer; or you may choose to upgrade to one of our S class Mercedes which provide even more passenger space and comfort. Either way we provide our guests with a stylish and relaxing transfer. The Mercedes MPV's have individual captain style seats and they can be configured to face one another to accommodate meetings, working whilst travelling or social chat; or they can all face forwards if preferred. The vehicles also have a discreet table which can be employed whilst the seats face one another. All of the vehicles are meticulously maintained, valeted and serviced. They are all licensed and fully insured. Whatever your requirements you can be assured of first class travel with Star In A Car Ltd.
For further vehicle options see our Unit Cars & Location Vehicles.